Footballers from the Ukrainian club Shakhtar Donetsk were turned away from Mohamed Al Fayed's Harrods store - two days before playing his Fulham team. The players, wearing squad tracksuits, were denied entry to the Knightsbridge store on Tuesday ahead of their Europa League match at Craven Cottage. Shakhtar Donetsk said its team was told the group was "too big and suspicious". A Harrods spokesperson said they were denied access for "health and safety" reasons and it was not meant to offend. A post on the Shaktar Donetsk website read: "The players decided to increase the earnings of one of London's reputable shops - Harrods. "The footballers, who have money and are eager to buy a lot, were certain to leave a big sum. "But staff said the group of customers was too big and suspicious." It continued: "The players explained that this was the football team and they had no habit of taking tuxedos to the training camp to go shopping. 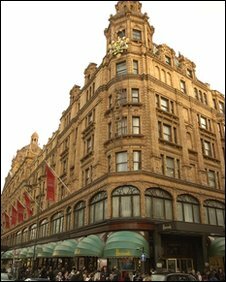 A Harrods spokesman said: "There are periods, when the store is at its busiest, that Harrods has to take the difficult decision to deny access to tour parties. "This is done in the interest of health and safety." He added: "Needless to say, we do not wish to offend or upset visitors when making these decisions."